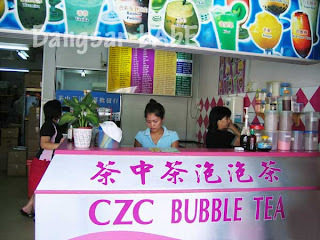 rif told me about this nice bubble tea place called CZC Bubble Tea in Dataran Mentari (down the road from Yuen Steamboat Buffet). Since today was a public holiday for Selangor and we were at Sunway Pyramid, we decided to to pop by. 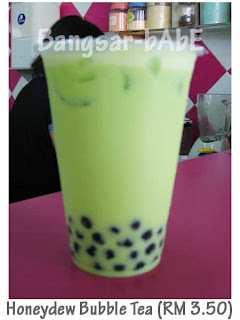 Got there around 3.30pm and ordered a honeydew bubble tea for rif. I was undecided between yam bubble tea and green tea bubble tea for myself. In the end, I chose the former. 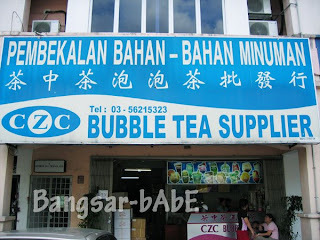 A cup of bubble tea cost RM3.50, pretty reasonable by my standards. Size-wise, it’s bigger than the bubble teas sold at pasar malams. 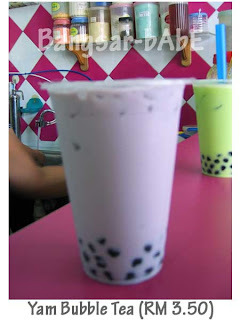 The bubble tea tasted pretty good; really smooth and milky. They were also generous with the pearls. Each sip came with two to three big pearls! Between honeydew and yam, I liked yam better. I’d come back here again, but not before calling them to check whether they are open. A few months back, we drove all the way there only to find them closed. o_0 Good stuff. Go try it for yourself! hehehe…u should try other flavours…my fave is the purple plum….and also the choco mint…hehehe…. Hai, Just wondering are your Halal or non- Halal? ?